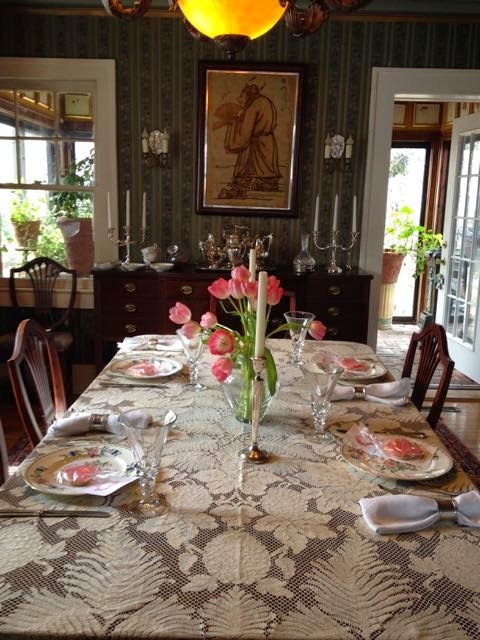 Every year since I gave up my other life, I've given a Valentine's Day Luncheon for friends. Well, perhaps Valentine's Luncheon would be a better description because if the day fell on Saturday or Sunday, I had it the Friday before. to celebrate Valentine's Day -- a day early. 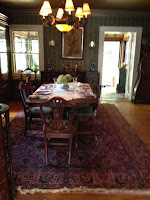 The luncheon, of course, was in the dining room. 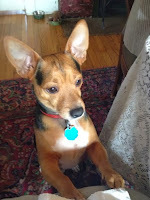 My new lace tablecloth (a Christmas gift from friend Sally) was on the table. Lace, to me, is always elegant. And always my first choice for a Ladies' Luncheon! 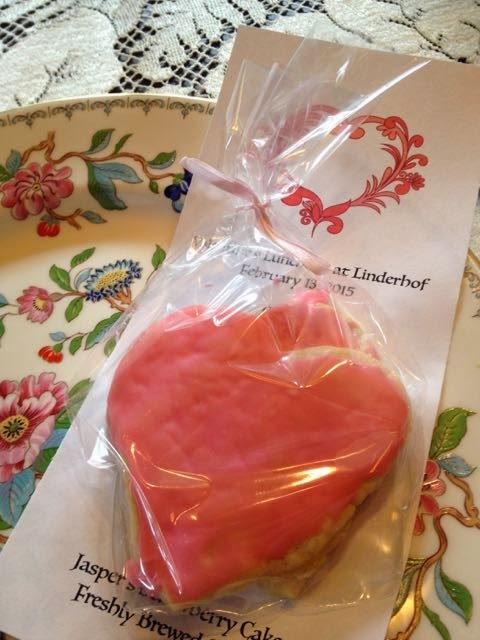 It's a "pink" Valentine's Luncheon at Linderhof. 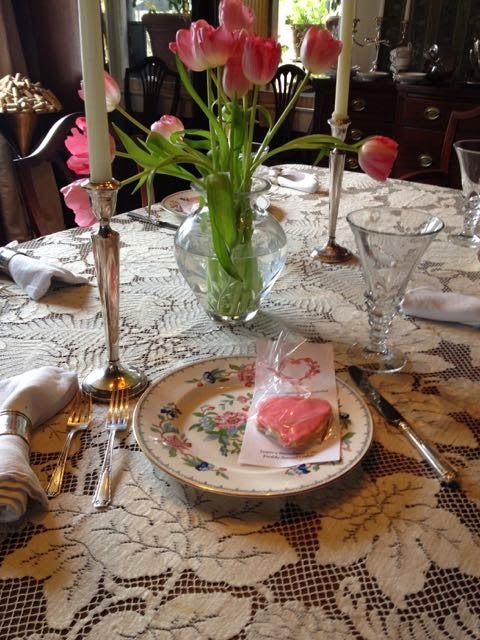 Pink tulips as the centerpiece. 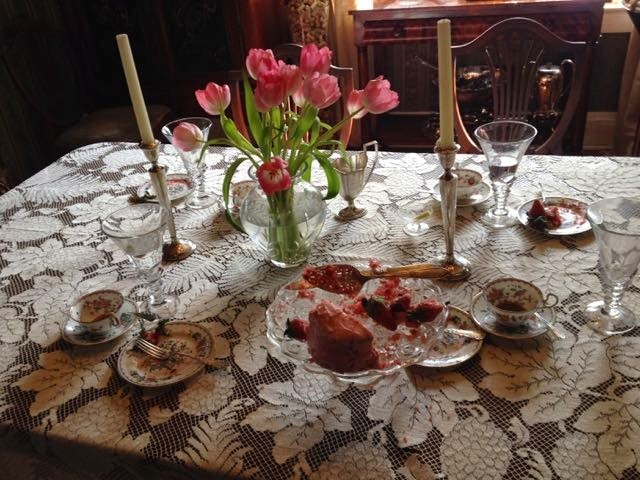 The china is my Aynsley Pembroke which has a lot of pink in it! A pink heart on the menu and two frosted pink cutout cookies as a favor to take home for tea this afternoon. We started with a tossed green salad with poppyseed dressing. 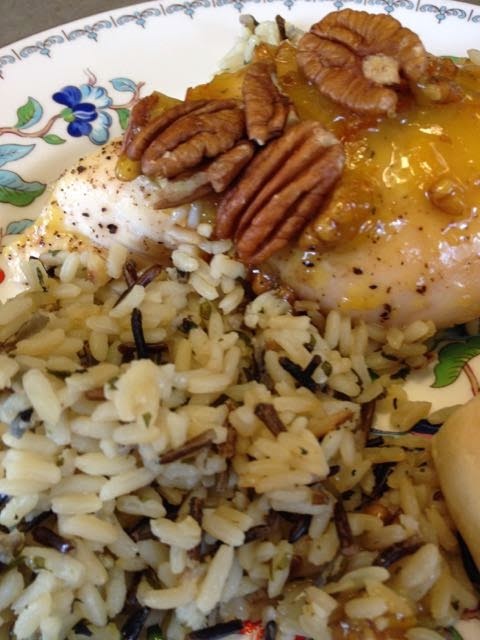 And the main course was this delicious orange pecan chicken with white and wild rice. To me, a chicken breast and white and wild rice is Ladies Lunch food. This is a yummy recipe and a favorite! A Valentine's Day dessert needs to be spectacular. But it doesn't need to be chocolate. Or even red! 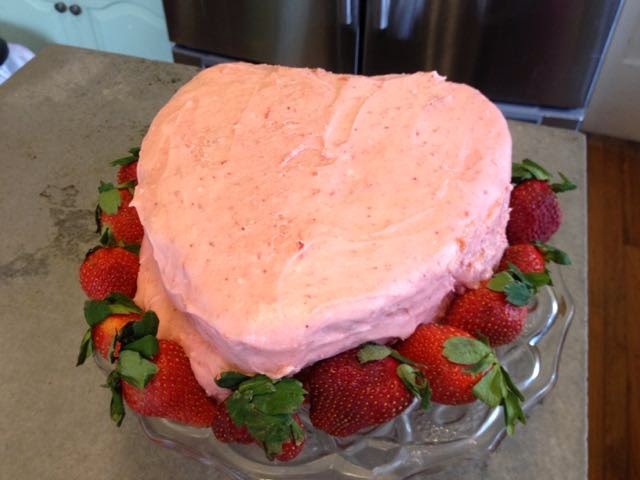 A "pink" layer cake circled with strawberries. Actually, it's a strawberry cake and I used Jasper's recipe -- Jasper's the great KC Italian restaurant. It was the perfect dessert for Valentine's. 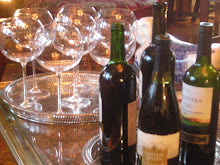 And, of course, one of my favorite photos when we entertain -- the table after everyone has gone! It says that a party has been held here and that everyone had a good time! And just because . . . I had the camera in hand. 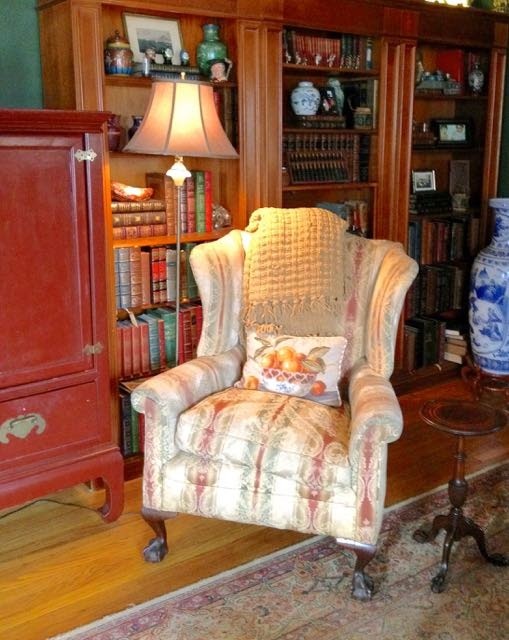 I moved one of the wing chairs -- to the other side of the room for I found a darling little candle stand that seemed to be perfect next to the wing chair. And a chair needs a lamp and so I brought this one back downstairs. It looks like the perfect spot for immersing oneself in a book! Cook the rice according to directions on the package, using chicken broth instead of water. Preheat the oven to 350. Place the chicken on a baking pan. Drizzle with olive oil, salt and pepper. Bake for approximately 25 minutes. In a saucepan, combine the 1 T. butter, marmalade and orange juice. Bring to a boil. Dissolve the cornstarch in a small amount of water. Slowly stir in enough of the cornstarch to thicken the butter/orange mixture. Add the pecans. Place the cooked rice in a 9 x 13 pan. Arrange the baked chicken on top of the rice. Pour the orange glaze over the chicken. Return to the oven, and cook for 12 to 15 minutes or until the glaze begins to brown. Mix cake mix, jello, oil, eggs and water in a mixer bowl with paddle attachment. Add strawberries and pour into 2 greased and floured 9 inch cake tins. Bake at 350 until done. Cool. Mix butter and powdered sugar until well blended. Add strawberries. Frost cake. Thanks for the recipes. Your luncheon looks delicious. So pretty! And thank you for the recipes, too! Can't wait to try them. Happy Valentine's Day Martha! Your table is gorgeous. 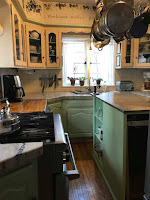 I was so happy to see that you had shared those recipes with us because I was going to request them. Thank you so much! Once again, all I can think is 'lucky guests'! It all looks beautiful and sounds delicious.